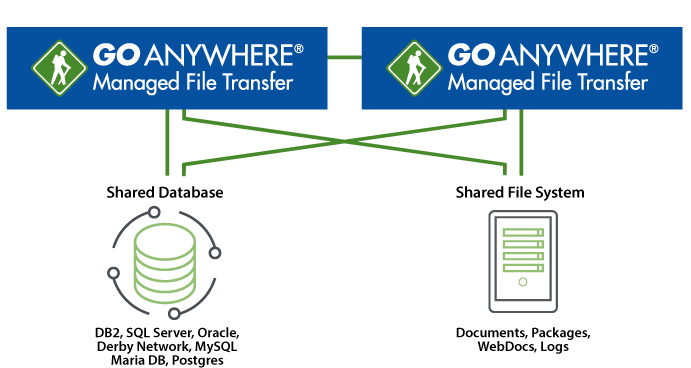 Clustering two or more GoAnywhere MFT installations will provide a distributed environment for handling file transfer services for the enterprise. Two significant advantages which clustering offers in GoAnywhere MFT is greater high availability with true "active-active" support and load balancing by allowing workloads to be distributed across multiple systems. The inherent active-active support with GoAnywhere MFT clustering will provide the maximum high availability for your mission critical environment. If a GoAnywhere MFT system were to fail (for example, due to a network or hardware failure), the remaining systems in the cluster will continue to process file transfers and run workflows. This can help your organization to minimize downtime, meet Service Level Agreements (SLA) and increase user satisfaction. GoAnywhere MFT can be scaled horizontally by adding additional systems to the cluster. When paired with a load balancer like GoAnywhere Gateway, each inbound connection to the File Servers can be distributed to the available systems to service your employees and trading partners. For file transfers performed in workflows (Projects), clustering allows the workload to be distributed across all systems to increase performance and throughput. As your business and transfer requirements grow, GoAnywhere MFT can easily grow with it by adding additional systems to the cluster. Learn how GoAnywhere MFT can be implemented to provide maximum high availability and scalability. A communication channel is established between all GoAnywhere MFT systems within a cluster to keep them in constant communication with each other. Administrators can login to a browser-based interface to configure and manage all GoAnywhere MFT instances in the cluster. Two or more GoAnywhere MFT systems within a cluster can connect to the same external database at the same time. This allows these systems to share security settings, project definitions, job schedules, monitor configurations, trading partner user accounts, and other details. GoAnywhere supports a wide variety of backend databases including Microsoft SQL Server, MySQL, MariaDB, PostgreSQL, Amazon Aurora, Oracle, DB2 for IBM i, and Derby. The execution of scheduled jobs will be distributed across the cluster to share in the workload of running projects. Monitors are evenly distributed across the cluster allowing for quicker scanning of directories. Audit trails for all GoAnywhere MFT systems in the cluster can be viewed from within one screen in the browser-based administrator. The Active Sessions screen displays all trading partner sessions (IP address, user name, login date, audit activity) for any system in the cluster. Within this screen, sessions can also be terminated (killed) on any system in the cluster. GoAnywhere Gateway configurations can be viewed, updated, started and stopped from any GoAnywhere MFT system within the cluster. Brute-Force and Denial of Service (DoS) attack prevention details are shared with all systems in the cluster. The Max Sessions setting for a Web User account will limit the total number of that user's sessions for all systems within the cluster. For instance, if the Max Sessions for a Web user is set to 2 and if they are logged into 2 different systems in the cluster, then they will not be able to open any additional sessions in the cluster at that time. Setup and configuration is greatly simplified since GoAnywhere MFT does not rely on any third-party tools. Everything you need to set up a clustered environment is built into the product. Request a quote for reliable active-active clustering features in GoAnywhere MFT.